Our Festival Photography Evening features Tony Bramley, Royal Photographic Society Fellow of the Year 2016. Tony has developed what he calls ‘Transitional Photography’, taking the ethos of Russian avant garde painter Kazimir Malevich’s Suprematist work and developing a pure version within photography. Tony Bramley’s abstract ‘Suprematist’ photographs are about as far removed as possible from the wedding, photojournalism and commercial photography that is the staple business of his company, Storm Photography Ltd of Marks Tey, near Colchester. “A single scene is selected, photographed, and reduced to its geometry through rejection & separation, producing a photographic abstraction that has independence of form. Everything else is insignificant and of no artistic value”. 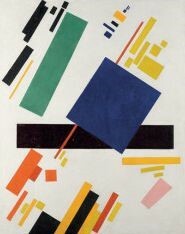 ‘Suprematism’ was a highly geometric style of early 20th-century non-objective abstract painting developed by Russian avant-garde artist Kazimir Malevich (1879-1935), which ignored the familiar appearance of objects. To Malevich Suprematism was “the rediscovery of pure art which, in the course of time, has become obscured by the accumulation of “things”.